If you are thinking that the Napoleon cat breed may have something to do with Napoleon Bonaparte (shrewd emperor) you’re right. The Napoleon (cat breed) takes its name from Napoleon (human) because of its petite stature – the man and feline both were/are short. Let’s explore the Napoleon cat breed to discover its history, overall appearance, personality, health concerns, and so much more – if you want to learn more about Napoleon (its namesake), you’ll have to Google him. Taking its place among the many “dwarf” cat breeds, the Napoleon (or Minuet Cat, as it’s sometimes referred to) is a relatively new breed. Joe Smith took an interest in the unique genetics of the Munchkin cat – this could be due to the fact that he was a breeder of Basset Hounds. He crossed a Munchkin with a doll-faced Persian cat (has a longer snout) in 1996. In 2001, Smith got in touch with TICA to add his new breed to the collection of Experimental Breeds. Margie Gardner and Sam Tate picked up the feline ball and helped to move this breed forward. Teri Harris then presented the Minuet to TICA in 2011, finally getting it to the point of being recognized as Preliminary New Breed. Having been compared to a Dachshund, the Napoleon cat is low-slung, yet still maintains a strong and solid bone structure with good muscularity. The legs will be short in the standard version, but longer in the non-standard version. The head is round with large round eyes (like the Persian) as well as the cheeks, muzzle, and face. The Napoleon’s ears are small to medium in size. Unlike its Persian heritage, the nose of this cat is broad and straight. The coat of this breed comes in a wide range of colors and patterns and is luxurious and plush to the touch. It can either be long or short. The longer coat does have a thick undercoat and straight, soft hairs, whereas, the shorter coat is dense and soft. If you’re looking for a sweet feline with a loving temperament, you will be very happy with the Napoleon. This breed has a warm personality, is social, and very docile. The Napoleon is also an active pet that enjoys spending time in the company of its human. This is important to know, as a Napoleon that is left alone will be very unhappy. 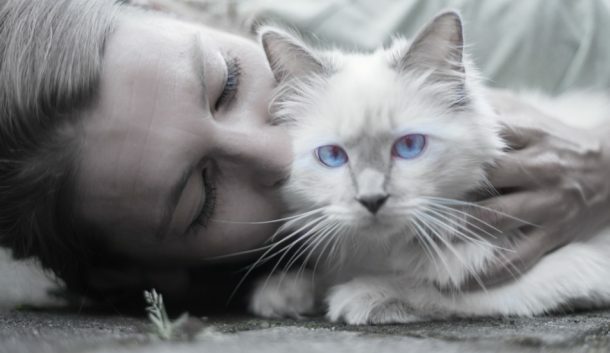 They not only enjoy spending time with people, but other pets and other cats will fit the social “bill” as well. This feline has been loving described as affectionate, people-orientated kitties that are also curious and energetic. Although the Napoleon is a healthy breed, there may be some genetic issues it is more prone to because of its lineage. Peritoneopericardial defect – a hernia in the abdominal region. Photophobia – an abnormal sensitivity to light. 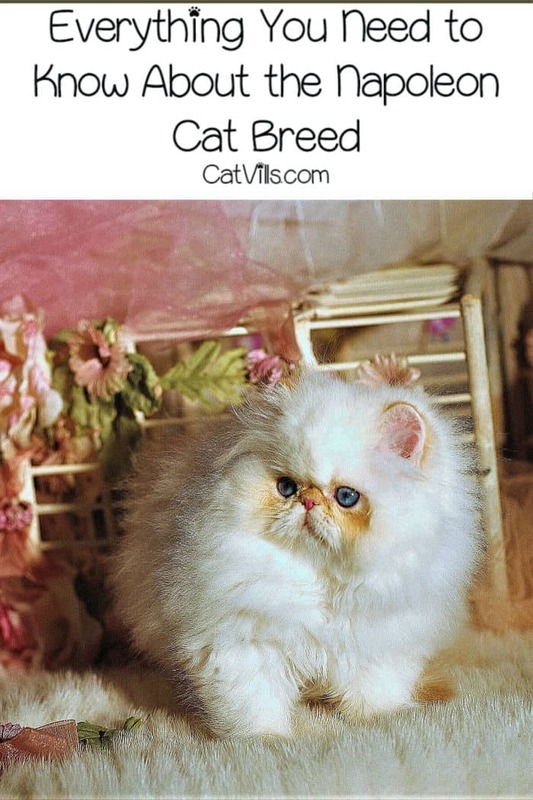 Before you adopt a Napoleon cat, be sure to ask the breeder if his/her cats have ever had any of these genetic issues. A high-quality diet is vital to the overall health and well-being of your Napoleon cat. For optimal weight, feed your Napoleon cat a balanced diet that consists of a pure protein (as the first ingredient), supplemented with added fruits, veggies, and a minimum of fillers (corn, wheat, by-products, etc.). If your Napoleon has a long coat, you will need to groom her daily to maintain her skin and fur health. Short haired Napoleon’s will need to be groomed once a week. Regardless of breed, you should brush your cat’s teeth – many health issues can stem from the bacteria that builds up from the lack of good oral hygiene. Try to do this daily, but if that task is not possible, once a week is better than nothing at all. You will also want to trim your kitty’s toenails and provide her with plenty of toys and scratch posts. Lastly, be sure to have your Napoleon spayed or neutered and keep your cat indoors. The world can be a rough place, so exposing your innocent feline friend to disease, internal and external parasites, vehicles, and attacks from other animals and unscrupulous people is not recommended. As the Napoleon breed gains in popularity, kittens may be more readily available for purchase. However, they may be pricey. Always research the breeder before you adopt a kitten from the cattery. Places that will not allow you to see the facilities or the parents of the kittens are most likely not a wise choice. A good breeder is open to questions, providing you with honest answers and encouraging you to seek all the information you need to make an informed decision. What do you think of the Napoleon cat breed? If you have a Napoleon or would love to give one a home, be sure to drop us a line in the comments section, we’d love to hear from you. Ahh! This is the cutest cat bread ever! I’ve been obsessed with them on IG. Thank you for giving us a little education on them. This was an interesting look into this breed. I see them all over social media. It’s no surprise. They are adorable. Thanks for all this education. I have never heard of this breed. They look like a very loving cat. We have a dog, so I’m not sure how that will go over. These are cute and adorable cats! They sound like an ideal family cat. Great history of the breed. That is an interesting breed of cat. They almost look like Ewok like creatures. I would be concerned about all the genetic issues that they may have though. “The Napoleon is also an active pet that enjoys spending time in the company of its human.” This sounds too good to be true! LOL! The cats I’ve been around are usually more into themselves than humans. Such gorgeous cats I knew nothing about. Very lovely, I’d love to have one! Aww..they are so cute!! Thanks for sharing these facts! Oh my goodness, these cats are the cutest! I have not heard of this breed before. Thank you for the enlightenment. Now I want one to snuggle! Those are beautiful cats and kittens. I am always excited to hear about new breeds. Great information. Beautiful cats! I never knew the exact Breed. Very cool. I don’t think I’ve ever seen one. Sure is a little beauty though!